Spence-Lowry Family History – Page 11 – Connecting the dots on my tree with solid lines! Researching my African American genealogy in Pasquotank and Camden counties of North Carolina. The family stories passed down from generation to generation tends to change. No one wrote it down; it’s always by word of mouth. I have 2 main stories in my family that are either inconsistent or just not true! My great grandmother, Bessie Lowry, had an older brother named Shelton Lowry (B: 1908, D: 10 Sep 1947). The story from my great aunt was he died in a drowning. He was out on a boat and someone started rocking the boat. Shelton told them ‘don’t rock the boat, I can’t swim’ and he and a friend fell in the water and drowned. The story from another great aunt is everyone in the boat died. Hopefully some info from the FRSNNC will help clear this up. Now for the complete untruth. Leroy McCoy, possibly the son of Ernest McCoy who is the son of William Everett McCoy (my 3rd great uncle), was researching the family tree until his death in 2005. He told several elder Spence family members a story. I remember when I first heard this story, before I began researching the tree, I said it didn’t make sense. So, here we go. Back in the late 1800’s, 3 Spence brothers came over on slave ships and were separated thru sale. They landed in various counties in NC; Pasquotank and Camden being 2 of them. Our real name was SPENCER however was changed to SPENCE when we were sold into slavery. Remember, this is the late 1800’s. at we came over on slave ships in the late 1800’s. The Spence brothers that were sold into slavery was either my great grandfather, Aaron, and his siblings or my 2nd great grandfather Aaron (to be know as Aaron Sr.) and his siblings (have no clue who his siblings are). The truth being that none of the above happened. Aaron Sr was probably born into slavery. His parents are Enoch Spence and Susan Williams who were also slaves. They officially married in 1866. I’m certain they had other children; however, I haven’t been able to locate them. In 1900, Susan was living with, Aaron Sr. On the 1900 Census, it states she had 6 children and 4 living. I’ll be discounting the ‘SPENCERS on a slave ship’ theory that the elders have included in family history. Hopefully they don’t throw stones. I went to my dad’s house last week and we were looking thru the book my aunt made and I asked him, who is these people? He looked at the picture and said this is a picture of your great grandfather, Aaron Edward Spence, and your great grandma, Bessie Lowry when they were younger. I would have never known that. This is my great grandparents when they were older. I never got a chance to know my great grandfather. He died 6 years before I was born. However, I did come to know and love my great grandmother dearly! She raised my father like a son. When ever I would see her she would tell me the same story. “I was the first one to hold you when you came home from the hospital.” Recently my dad told me the whole story. My great grandmother (Bessie) worked for a white woman in Elizabeth City, NC cleaning her house. The woman would often travel and Bessie would travel with her. I suppose they had a pretty good working/friend relationship. This one trip, the woman happened to be coming down to FL and of course Bessie went along. She took it as an opportunity to see her grandson and his family. The day they arrived in our city, my mother was just discharged from the hospital from having me. When we arrived home, Bessie was waiting at the door for us. That’s when she scooped me up and the first one to hold me when I came home from the hospital. It was a matter of pure coincidence or divine intervention. My mother told me that it was a blessing having her there for almost a week because she took care of almost everything. Gave her time to rest and recover. I miss hearing that from Bessie. I saw this on Jennifer’s blog, But Now I’m Found, and I thought it was a great idea. So, I borrowed it. I would love to ask my great great grand father Aaron Edward Spence what his brothers and sisters’ name’s are. I know he had siblings, but I haven’t been able to locate them. I wish I could as my great great grandfather William Lowry if that was really him living with his grandfather in 1880 and did he change his name from Barker to Lowry. Also, is he part Indian? Does he have any siblings? Who is Issaac Boykin and Alfred Ferebee that was living with him in 1880? How did he feel when his mom married and left him with his grandparents? 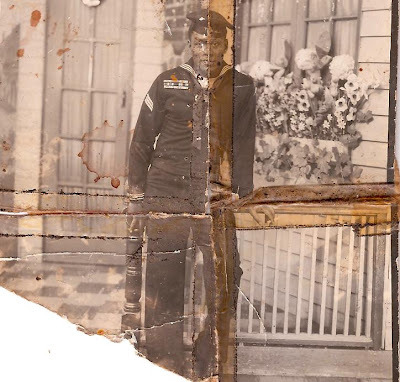 I wish I could ask my grandfather, Aaron Edward Spence, who George Washington Bolden is? What is the real story behind my dad living with them as a kid? How much land did he own? Lastly, I would love to ask all the ancestors…….WHO ARE THESE PEOPLE?!?!?!?!? This is George Washington Bolden/Bowden/Baldwin. Excuse the variation of the last name, my grandmother could never tell me what it really was. He is my paternal grandfather. Neither I nor my father has ever met him. My dad joined the navy for 2 reasons; because he was drafted and he wanted to find his father. My grandmother has never really given much info about this man and I’m not to sure why. But my father and I would love to know who he is. She’s not sure if his last name is Bolden/Baldwin/Bowden. But, she’s sure that it’s George Washington. He called her about 2 or 3 months after the initial meeting. She told him she was pregnant and he said that he would come back and marry her. She said no. She says that he was older, maybe in his 20’s. It was a one time thing. It wasn’t a one time thing. He’s been to their house before and all the sisters just thought he was so cute. She thinks there was more to the relationship. My grandmother was 16 when she had my father. My father was conceived in December of 1952 when my grandmother was 15. He was in the Navy in 1952, probably working in Norfolk, VA.
Based on the stripes on the sleeve, he was in for at least 8 years and he was an E-3 by the time this picture was taken. If the picture was taken about 1952 or 1953, that means he joined the Navy around 1944. I believe that the youngest they could have been to enlist was 17. That means that he could have been born anywhere between 1920 to 1928. My grandmother was born 1936 and she claims he was much older than her. He’s not from Pasquotank or Camden, NC. He always visited with some distant cousins and stayed with them. That tells me that maybe his home is to far to travel when he was on leave. He was probably on Christmas leave in 1952 when he and my grandmother ‘hooked up’. Last he saw him was around 1955 to 1965. he was on his way to Trinidad on deployment. He worked on the docks with him. Last he talked to him, George was getting deployed to Trinidad some time in the 50’s. My father is the oldest of all her children and the only one with a different father. My grandmothers 1st husband took the picture when my dad was young and tore it up. This is the only picture we have of him. I intend on getting the picture restored. I sent it off once, however the picture that came back looked HORRIBLE! It didn’t even resemble this. My father was raised by his maternal grandparents, Aaron Edward and Bessie Spence and on several documents he’s listed Aaron Edward Spence as his father. Now what? It’s not like the Navy enlistment records are available online. So, how can I locate him??? Sometimes the hardest part of your genealogy research is the living relatives. Searching for African American ancestors makes this increasing difficult as well. Over generations, African Americans did not talk about their ancestors. Sometimes stories were passed down, but not necessarily shared among everyone. My family double related. You would think this would make it easier for me to get information. However, it’s not. It makes it more difficult. For whatever reason, my family, the Bessie Lowry/Aaron Spence side, isn’t that close with the other side, Rosa Lowry/Enoch Spence side. My own perception of it is: The Rosa Lowry/Enoch Spence side MOVED. They didn’t stay in the small town and most moved on to MD or VA. However, the Bessie Lowry/Aaron Spence side remained in Pasquotank (Elizabeth City/Newland area). Not many of them moved on. I guess from there, some members of the family seemed to have grown apart. I wonder if the Lowry sisters were close with each other. There was a 10+ year age difference between them, but it just makes you think. They married brothers, they should have been close. How interesting. Searching for Pasquotank in Google’s Blog search, I found this article. The participation in this February’s National African-American History Month throughout the Albemarle has been phenomenal, and Wednesday night’s event at the Pasquotank-Camden Library was no exception. By 7 p.m. Wednesday night, the Community room of the Pasquotank-Camden Library was packed full with a diverse range people, all eagerly awaiting tales of the African-American history in their area. If you are researching family in northeast North Carolina and haven’t joined Family Research Society of Northeastern NC (FRSNNC), you’re doing it all wrong! I came upon FRSNNC early in 2007 when I was really getting into my family tree. I sent them an e-mail seeing if they could help me…and they did! They sent me documents helping with my search and guided me in the right direction to go forward. The counties that they cover are Camden, Chowan, Currituck, Dare, Gates, Pasquotank and Perquimans. They know the ins and outs of those counties. They can tell you about traditions and records. They are a non profit organization and everyone that works there is a volunteer. Membership is only $20.00 and with that, you get a quarterly newsletter (more like a book), member directory, surname lists and endless help. The newsletter is full of useful information. It has stories, obituaries and plenty of information to help you with your genealogy research. Even if you’re only researching one of the counties listed above, I suggest you join the organization. In the picture book my aunt made, there was a picture of Alfred (B: 1907) and Thelma Ferebee (B: 1910)-pictured to the left. Below them, there was a picture of Maggie McCoy at age 100. There was no description of these people and when I asked her nor could anyone else tell me exactly how they’re related. My great uncle told me that Ferebee was related thru his father, a Spence. But, that didn’t make sense, especially since I couldn’t find any Ferebee’s in the tree, except for the one living with William Lowry in 1880. I began obsessively researching Alfred Ferebee. I first found Alfred and Thelma living with Alfred’s brother, William Ferebee, in Camden County, NC in 1930. It was obvious that Alfred and Thelma recently married since they had a 7 month old daughter named Vivian at the time. I knew I wouldn’t find them together in 1920. In the 1920 census, Alfred and his brother, William, were living with Julian and Ella Daniels in Camden County, NC listed as nephews. Then in 1910, I found Alfred and William living with their parents in Camden County, NC, Luther and Daisy Ferebee. The birth index for Alfred lists his DOB as 5 April 1906 and his father as Speed Ferebee. I found another birth index for William Edward Ferebee with a DOB of 28 June 1903 and his father was Speed Ferebee. Maybe Speed was a nickname for Luther. Unfortunately, a lot of Camden County records aren’t available thru Ancestry.com like Pasquotank County. So, marriage records didn’t show a marriage between Alfred Ferebee and Thelma. I called my uncle again and asked about the Ferebee’s and he said that he thinks we’re related to the wife, Thelma, and not Alfred. Why didn’t he tell me this the first time?? That means Thelma is a Spence, Lowry, Banks or McCoy since those are the main branches of my tree. *Genealogical info-When a couple decides to get married, the man would apply for the license in the county the woman is from. My McCoy line is the only one from Camden. She must have been from Camden also since there was no marriage record for a Thelma marrying anyone with the last name of Ferebee in Pasquotank. I searched by Thelma McCoy and found one on the 1920 census living with an Everett and Maggie McCoy. Well, there’s my Maggie…possibly. In 1920, he’s listed as William E. McCoy (B: 1882). So, now who are Everett and Maggie McCoy? I was only able to go as far back as 1910. I didn’t know Maggie’s maiden name to search her on the 1900 census and William didn’t show up on that census. I sent a letter to Camden County Register of Deeds for a copy of William E. and Maggie McCoy death certificate. When I got it back, William’s parents were Henry and Columbia McCoy. Those are my 3rd great grandparents. That means that William E. McCoy is my 4th great uncle and Thelma is a cousin (don’t to what degree). I didn’t have any record of William and since he was born in that ‘black out’ period, he was hard to know about. Oh and Maggie, well, her maiden name is Ferebee. *Genealogical info-What I call the ‘black out’ period, is that time between 1881-1899 when most of the 1890 census were destroyed in 1921 during a fire in the basement of the Commerce Building in Washington, D.C. When I presented this new uncle to my grandmother and great uncle, they didn’t have any idea. They knew that Alfred, Thelma and Maggie were related, but just didn’t know how. Every time I talk to my family, they give me more and more information. On a conversation with my grandmother about a month ago, she was telling me about a funeral home in Elizabeth City. It was owned by Dennis Stallings. She said that he was a cousin of ours. But, of course, she didn’t know how. She knew that Dennis’s mother was Betty Spence and she married Dennis Sr. The current owner of the funeral home is the son. She also mentioned another name, Oscar Spence and he was related to Betty some kind of way. So, as a genealogy freak, I was searching Ancestry.com as I was holding the phone w/my grandmother. Betty Spence’s real name is Dorothy Elizabeth Spence. She married Dennis Stallings in 1950. Dennis was the son of Cader Stallings B: 1885 and Ella Bright B: 1892. Betty was the daughter of James A. Spence B: 1891 and Bettie Temple B: 1896. James and Betty also had a son named Oscar. Well, I don’t know. I do know that James and Betty married in 1912. So, in 1910, James would be listed either alone or living with his parents. He would only be 19 at that time. DAGNABIT, there is no James Spence in 1910. Maybe he’s off working somewhere. But, in 1900, I did locate him. Living with his parents Moses Spence B: 1846 and Louisa Turner B: 1855. This takes me back to the possible slave owner, Thomas B. Williams. He owned a male slave in 1860 that was age 12. Maybe Moses is a sibling of my ancestor Aaron Edward Spence. But, what I will be doing to verify this is. Luckily Moses died after 1913, how morbid but we genealogy freaks love when ancestors die AFTER records are kept. Which in Pasquotank, it was after 1913. Am I the only one that wished family kept records knowing we’re going to research this later?!? Today’s family profile is of Aaron Edward Spence. Based on his death certificate, he was born 29 September 1853 in Pasquotank County, NC. I suspect he was born into slavery considering that his parents, Enoch Spence and Susan Williams are not listed on the 1860 census. Nor is he or his parents listed on the 1870 census. Black folk shied away from government people in those days. I believe that Aaron and his parents were owned by slave owner named Thomas B. Williams. Now this is a guess based on the fact that Susan’s last name was Williams and Thomas’s wife, Ellen, was the neighboring white family in 1880 when Enoch and Susan finally showed up on the census. It’s possible that the family remained serving the Williams family even after emancipation. I know that Thomas owned slaves in 1860. Enoch would have been abt 53 in 1860 and Susan would have been abt 47. I’m ordering the estate records from NC state archives to verify this. In 1877, Aaron had married Hester Riddick of Pasquotank County, NC (B: 1856), daughter of Edward and Sophia Riddick. Neither Aaron nor Hester shows up on the 1880 census. It’s possible that Hester died in childbirth because by 1888, Aaron had remarried. Dineppa (Dinah) Bogues/Boague of Pasquotank County, NC was his 2nd wife. They both were on their 2nd marriage. Dineppa was previously married to Oliver Foreman. I suspect that Oliver passed away and she remarried. However, she too also passed away. I haven’t been able to find record of that, but divorce was not something that was very common. In 1892, Aaron married for a 3rd time to Cora McCoy of Camden County, NC (B: 1871, D: 07 Oct 1922). That union yielded 9 children. Berna B: 1893, Enoch B: 1894, Herbert B: 1896, Clyde Lee B: 1898, Blariche/Blanche B: 1900, Pearl B: 1902, Mabel B: 1904, Aaron Edward B: 1906 and Charlie Mack B: 1909. I believe Aaron to have been the youngest of his siblings or the youngest living. By 1900 census, his mother Susan was living with him. She’s listed as 86 years old at the time. She’s also listed on the census as having 6 children and 4 living. These are possible siblings that I have to research further. Excuse the roughness of this, these are my notes. Enoch Spence born abt 1825. Only shows on 1870 census married to Prissy. By 1880, Prissey is a widow. Joseph Spence born abt 1830. Living near Enoch Spence on 1870. Married to Tilley. John Spence born abt 1832. Living in Pasquotank 1870 married to Winney–oldest son Anderson. Living nearby is a Williams (white) family by 1880, John died and Winney/Vinney is a widow. Jennie Spence. Married Edmund Sawyer 1873. Possible sister. Martha Ann Spence married Jacob Moore 1880. Possible sister. There’s a Martha L. Moore living with Hardy Measels in 1880 listed as widow and sister in law. Meaning she’s Hardy’s wife (Fanney) sister. Fanny maiden name was Temple. Married Hardy in 1871. May not be the same. Martha J Spence married Daniel Godfrey 1894. Nancy Spence married Alfred Ferebee jr. 1902. Possible sister. –Side Note, this is also the same Alfred Ferebee that could be a possible half brother to William Lowry. CORRECTION 08/04/08-Her maiden name is Griffin. She married Moses Spence then married Alfred. Not a true Spence. Sarah E. Spence married Henry Murden 1894. 1910 Henry Murden living in Pasquotank w/wife Anna. Then moved to PA.
Aaron died in 1920 and Cora died 2 years later in 1922 in Pasquotank, NC. Their death certificates state that they were buried at Hinton BG. However, I haven’t been able to locate that. My grandmother said that it’s located further down on Mill Pond Road. The same road my grandmother and great grandmother has lived for years. Off to do more research.